This four pack bundle has all that you need for a full week of delicious gingerbread fun. They will help Chocolate Chip and Joanna Gumdrop remodel the Gingy family's new home by calculating cost through the multiplication of decimal money amounts. 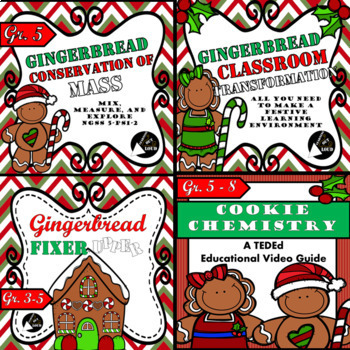 Then, they will explore the conservation of mass through a gingerbread baking activity. Optional STEM gingerbread building option is included. Teach chemistry and states of matter through the process of baking using the animated TEDEd video guide to understand the cause and effect of different ingredients and chemical reactions that take place during baking. All of this will fit in nicely as your classroom is transformed into a gingerbread haven using the classroom transformation kit.